Windbreaks are linear plantings of trees and shrubs designed to enhance crop production, protect people and livestock, and benefit soil and water conservation. Windbreaks can provide valuable opportunities for vine and tree fruit growers, row crop farmers, livestock producers, and rural homeowners. Crop yield and quality. By microclimate modification, field and orchard windbreaks have been shown to increase the yield of many different crops. Windbreak protection can be especially valuable in orchards and vineyards of high-value horticultural crops. IPM (Integrated Pest Management.) By incorporating plants that attract beneficial insects, windbreaks can also serve to increase biological control of crop insect pests. Non-timber products. By using trees and shrubs that produce specialty food or decorative products, e.g. chokecherry or corkscrew willow, windbreaks can provide extra income. Animal survival. 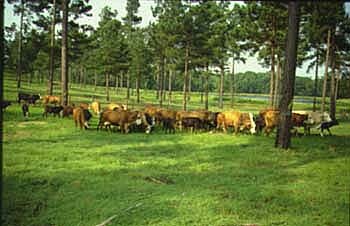 Tree-sheltered havens, or living barns, within pastures can make the difference between death and survival for livestock subject to harsh weather conditions, e.g. newborn and newly-shorn sheep. Livestock performance. Windbreaks around feedlots have been shown to improve the health and weight gain of cattle and sheep in cold climates. Timberbelts. Multirow windbreaks of fast-growing species such as poplar can be sequentially thinned for timber products while maintaining continuity of shelter. Soil and water conservation. Windbreaks are proven effective in reducing wind erosion of light-textured soils. By dispersing snow evenly across fields, windbreaks help make more moisture available for crops. Snow control. Properly placed windbreaks prevent snow buildup around buildings and o­n roadways. Energy conservation. Rural homes protected by windbreaks need 10-20% less energy for heating and cooling compared to unsheltered homes. Human comfort. Windbreaks around farm dwellings and rural communities improve quality of life for the inhabitants by reducing wind speed along with noise and dust. Established windbreaks increase property values and enhance aesthetic benefits. Wildlife. Trees and shrubs provide much-needed food and habitat for game birds and other wildlife. Carbon sink. It has been estimated that for each acre planted in field windbreaks, over 21 metric tons of carbon dioxide will be stored in the trees by age 20. Silvopasture is the intentional combination of trees, forage plants and livestock together as an integrated, intensively-managed system. Silvopasture can provide profitable opportunities for softwood or hardwood timber growers, forest landowners, and livestock producers. 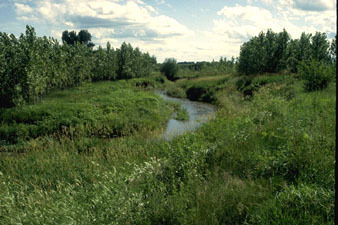 Riparian forest buffers are strips of trees, shrubs and grass planted between cropland or pasture and surface water courses. Buffers protect water quality, reduce erosion and flooding. Riparian forest buffers can provide beneficial opportunities for row crop farmers, ranchers, horticulturists, and dairy and livestock producers. Forest farming is the intentional cultivation of edible, medicinal or decorative specialty crops beneath native or planted woodlands that are managed for both wood and understory crop production. It does not include the gathering of naturally-occurring plants from native forests, also known as wildcrafting. Forest farming can provide profitable opportunities for forest and woodland owners, nut growers, sugar maple growers, and herb growers. Extra income and diversification. Cultivation of specialty crops in a forest setting provides new sources of annual or periodic income before, or instead of, timber harvests. High value products. A wide variety of plants can be grown in a forest to produce natural or processed (value-added) edible, herbal, medicinal, decorative and craft products. Ecologically responsible. The intensively-managed cultivation of forest plants that are endangered in the wild due to over-harvesting is the responsible alternative to wildcrafting. Suitable species. Shade-loving plants that are naturally adapted to grow under forest conditions are candidates for forest farming cultivation. Research cultivation methods. Gather information about the biological and cultural requirements of understory plants in your forest. If possible, talk to other growers in your area. Research propagation methods and find sources of seed or cuttings. Forest management plan. Any forest farming enterprises should be integrated within your forest management plan. Determine any needed actions such as thinning, and any potential conflicts with silvicultural practices, e.g., herbicide applications. Silvicultural benefits. Management of the forest canopy to provide optimum light levels for understory crops, e.g. by thinning and pruning, also improves tree growth and wood quality. Inventory. The first step is to identify native plants growing in your forest that may have economic value, and to assess the soil and climatic conditions of the site. The understory plant community changes as the forest grows and with silvicultural activities. Determine all the possible uses of the plants and products that can be made from them. Market survey. Visit both retail outlet and wholesale buyers in your area to learn what forest-grown products they buy, including those produced from plants growing in your forest or which could be cultivated there. Learn about the buyer’s specific requirements regarding quantities, sizes, seasons, prices, etc. Direct marketing. Retailing value-added products made from understory crops directly to buyers takes time but will give the best return to the landowner. Potential buyers include restaurants, ethnic markets, natural food stores and the public via the Internet. Wholesale. By harvesting and processing understory crops grown in your forest, they can be sold to wholesale buyers. Growers can benefit by forming marketing cooperatives to provide a larger, consistent supply of plant materials. Leasing. The simplest way to generate cash income may be to lease a portion of your forestland to others who will grow and harvest understory crops, although the return to the landowner will be less than other marketing methods. A clear lease contract is vital. Alley cropping is the cultivation of food, forage or specialty crops between rows of trees. It is a larger version of intercropping or companion planting conducted over a longer time scale. Alley cropping can provide profitable opportunities for row crop farmers, hardwood timber growers, nut growers and Christmas tree growers. Income diversification. Crop production during the years before nut trees come into bearing or hardwood timber is harvested creates cash flow and diversifies farm income, thereby improving the return o­n long-term investments in trees. Marginal land improvement. By planting rows of nut or timber trees o­n land where annual crop production is low due to erosion or other limitations, marginal croplands may be converted to higher value woodlands. Shelter. Rows of trees reduce wind speed, thereby controlling wind erosion. They also create sheltered microclimates that improves the yield and quality of crops growing in the alleys. Wildlife. Alley cropping increases the biodiversity of cropland which creates new habitat for wildlife. AFTA defines agroforestry as an intensive land management system that optimizes the benefits from the biological interactions created when trees and/or shrubs are deliberately combined with crops and/or livestock. There are five basic types of agroforestry practices today in the North America: windbreaks, alley cropping, silvopasture, riparian buffers and forest farming. Within each agroforestry practice, there is a continuum of options available to landowners depending o­n their own goals (e.g., whether to maximize the production of interplanted crops, animal forage, or trees). For over a decade, the Association for Temperate Agroforestry (AFTA) has helped bring together a community of interest around sustainable management practices for farm and forest land in North America. AFTA serves as an information resource for natural resource educators, researchers, extensionists, policy makers and land managers through scientific meetings, print and web-based publications, and o­nline forums. AFTA is a private, non-profit organization based at the University of Missouri Center for Agroforestry at Columbia. The mission of AFTA is to promote the wider adoption of agroforestry by landowners in temperate regions of North America. Anyone interested in agroforestry is welcome to become a member of our private, nonprofit organization, and enjoy the benefits thereof. We invite you to take advantage of a special rates for students and recurring memberships. Full access to the Members section of the AFTA website. Gain access to the members-only areas of our website with content not found o­n the public site. Discounted registration fees for AFTA-sponsored events. Members also receive discounts o­n registration fees to the North American Agroforestry Conference and other AFTA-sponsored events.